We are pleased to introduce a unique hotel to you as our, Hotel Hari Niwas is located at karnibagh opposite side of High Court Colony Ratanada in Jodhpur, Rajasthan, India. The hotel is located about 2Km from airport and 3.5km from railway station & bus stand. Hotel Hari Niwas is a budget property offering comfortable accommodation with personalized & professional service to its guest. It has 24 spacious elegant rooms, which is divided in two categories, one is super deluxe tarrif which is 4000 + taxes & deluxe is 3000 + taxes. All rooms facilitates with plasma L.C.D television and with heritage look furniture. We have a facility of 24 hours direct dialing telephone, runnig hot & cold water with 24 hours room services. 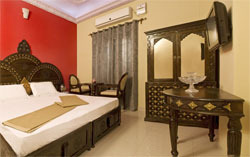 Hotel also have two dinning hall with unique furniture with a seating capacity of 40 - 50 persons. 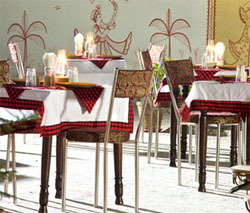 the dinning hall offers u breakfast, lunch and dinner with a Hari Niwas special & delicious veg. thali. Hotel offers you a conference hall that can accommodate 40 - 50 persons making ideal for formal, informal meet. Other servis\ces offered by the hotel facilities, travel desk, acceptance credit card, doctor on call, safe deposit locker at reception and parking facilities. We offer services, that makes your stay beautiful.